Kélina Gotman, Choreomania. Dance and Disorder, Oxford Studies in Dance Theory. Oxford University Press. When political protest is read as epidemic madness, religious ecstasy as nervous disease, and angular dance moves as dark and uncouth, the disorder being described is choreomania. At once a catchall term to denote spontaneous gestures and the unruly movements of crowds, choreomania emerged in the nineteenth century at a time of heightened class conflict, nationalist policy, and colonial rule. 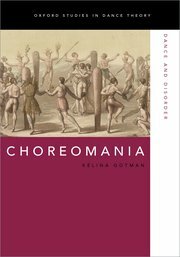 In this book, author Kélina Gotman examines these choreographies of unrest, rethinking the modern formation of the choreomania concept as it moved across scientific and social scientific disciplines. Reading archives describing dramatic misformations of bodies and body politics she shows how prejudices against expressivity unravel, in turn revealing widespread anxieties about demonstrative agitation. This history of the fitful body complements stories of nineteenth-century discipline and regimentation. As she notes, constraints on movement imply constraints on political power and agency. In each chapter, Gotman confronts the many ways choreomania works as an extension of discourses shaping colonialist orientalism, which alternately depict riotous bodies as dangerously infected others, and as curious bacchanalian remains. Through her research, Gotman also shows how beneath the radar of this colonial discourse, men and women gathered together to repossess on their terms the gestures of social revolt. Kélina Gotman is Lecturer in Theatre and Performance Studies at King’s College London. She is translator among others of Félix Guattari’s The Anti-Oedipus Papers (2006) and collaborates widely on dance and theatre productions in Europe and North America. Will this be avaialble in free download? May be warwich had it. Will also check. It’s available as an ebook, but you will have to go through a library if you want to read it for free.